In the OVA-based continuities, Tenchi is the grandson of a Juraian prince named Yosho and a Airaian priestess named Airi. He gains possession of a 'Master Key' called 'Tenchi', also known as the Tenchi Sword (Tenchi-ken), that can form a lightsabre-like blade. He later receives a special ring from Tsunami that can create a Juraian battlesuit for him and acts as a 'Guardian System', protecting him. Tenchi also has the innate ability (making him unusual as the only non-ship entity able to do so) to create kou-ou-yoku ('Light Hawk Wings'), and the ill-defined ability of 'material conversion'. 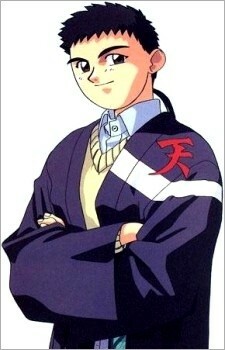 Tenchi initially lives in the city with his father to attend school and visits his grandfather's shrine every summer, where he trains to become a Shinto priest and learns his family's special style of swordmanship (which happens to be particular to members of Jurai's Royal Family). The house is permanently relocated next to the shrine after a battle between Ryoko and Ayeka, and Tenchi lives in the house with the girls while refusing to get intimate with them. Tenchi no longer attends school, after the school was blown up in OAV 1. Tenchi suffers a great deal of stress as he tries his hardest to be a gentlemen while most of the women within the household will take the opportunity to display their attraction for him. In the third OVA series Tenchi is discovered to be engaged to Noike (aunt of Ayeka and Sasami). The arrangement was done by Tenchi's great great grandmother, known better was the "Devil Princess of Jurai." Tenchi also found out around this time that he has an 80-year old sister named Tennyo Masaki, who looks like his late mother, Kiyone. Tenchi then learned from his grandfather, Katsuhito, that since Earth is a developing civilization, the Masaki clan must keep their true presence hidden since they do not age at the same rate as Earthlings, and those who are born into the Masaki family are also kept from these secrets until they come of age which is when they reach adulthood. After a climatic battle between the three Goddesses, the truth behind everything has happened was linked to the three. They decided to change the time line in order to repair the damage that they have done, and Tenchi, in his changed time line, doesn't get to meet Noike. However, Noike, along with Fuku, traveled into the past and altered the message Mihoshi was to send to her family (the message was originally altered by Z) so that she WOULD meet Tenchi. Tenchi is the most powerful character in the series, but is too young and immature to have full control over his Light Hawk Wings and other abilities. He is a competent swordsman and martial artist capable of superhuman feats thanks to his Juraian blood, but has only displayed his more unusual talents during dire situations, such as his duel with Kagato, the escape from a black hole, and the final confrontation with Z. The extent of Tenchi's powers is unknown; at one point they rage out of control, forcing the Goddesses to step in and prevent a catastrophe. Tenchi also has an unexplained connection to a high-level entity, superior even to the three Goddesses. Airi notes in GXP (the same continuity) that Tenchi has several powers they haven't discovered yet - some examples include his instant teleportation off of the planet when Z destroys the Earth, his speedy teleportation to Saturn when Z is about to slice him with his Light Hawk Wings, and his ability to keep up with his friend Seina in a race despite Seina having drastic body enhancements and going downhill on a bicycle.